Master Hand is one of the main characters and bosses of the Super Smash Bros. series. He is a large, disembodied, right glove who appears in every Super Smash Bros. game. Master Hand is voiced by Jeff Manning in the original, Dean Harrington in Super Smash Bros. Melee, Pat Cashman in Super Smash Bros. Brawl, and Xander Mobus in Super Smash Bros. for Nintendo 3DS / Wii U and Super Smash Bros. Ultimate, all of whom also voiced the announcer of that respective game. Master Hand's artwork for Super Smash Bros.
Master Hand prepares to fight a Yellow Mario. Master Hand makes his first appearance in Super Smash Bros.. After a character defeats all challengers, they are transported to a battlefield known as "Final Destination", where they battle Master Hand. After defeating him, players revert to their doll state. Aside from this, he also briefly appears in the opening where he brings out dolls representing the various playable characters as well as dioramas representing various stages and then snaps his fingers upon counting down to bring them to life. 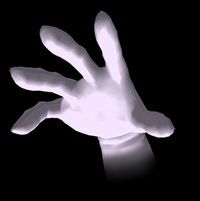 Master Hand reappears in Super Smash Bros. Melee as the embodiment of creation. In Classic Mode, the battle against Master Hand in this game is nearly identical to that of the original Super Smash Bros.; after defeating all opposition, the player faces Master Hand in Final Destination. If the player clears all stages on the normal difficulty or higher within 10 minutes without using a continue, Crazy Hand appears once Master Hand has lost half of his HP. Once defeated, Master Hand falls back into the void of Final Destination as the screen fades to white. The player reverts into a trophy, appearing among the trophies of others who have defeated Master Hand. Master Hand and Crazy Hand also appear in Event 50: Final Destination Match, where the player must battle the duo with 300 HP each. There is a glitch that allows the player to play as Master Hand through use of the third GameCube controller port. 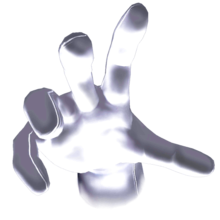 Master Hand is featured in Super Smash Bros. Brawl and the Subspace Emissary although he is never actually fought. He appears as a boss character in Classic and Boss Battles Mode. Crazy Hand joins him under the same circumstances as in Super Smash Bros. Melee; however, unlike in Super Smash Bros. Melee, Crazy Hand appears immediately at the start of the battle. In the Subspace Emissary storyline, Master Hand makes his debut as the leader of the Subspace Army, commanding Ganondorf, Bowser, and Wario. However, near the end, it is discovered that Master Hand is being controlled by Tabuu via the chains of light in order to trick Ganondorf, Bowser, and Wario into drawing the entire world into Subspace. Angered, Ganondorf attempts to attack Tabuu, but he is blocked by a force field and turned into a trophy upon smashing into Master Hand. This severs the chains holding Master Hand, which tries to fight Tabuu but is knocked to the ground by the force field, where he lies unconscious for the remainder of the mode. When Master Hand is knocked out, he does not turn into a trophy as everyone else does. Master Hand returns again in Super Smash Bros. for Nintendo 3DS, as the final opponent in Classic mode. At intensity level 3.0 to 7.9, the player will have the option to fight either Master Hand alone or together with Crazy Hand. At 8.0, the player is forced to fight Master Hand with Crazy Hand. At 5.1 and above, if the player faces both Master Hand and Crazy Hand, after enough damage is dealt, Crazy Hand will be engulfed in purple flames and exit the battle, while Master Hand begins to alter and faces the player as Master Core. Master Hand also appears in Super Smash Bros. for Wii U with a new mode called Master Orders and may also appear in Crazy Orders if the player clears a certain amount of tickets before facing Crazy Hand. Much like in the 3DS version, he is the final boss of Classic Mode and can transform into Master Core. Master Hand reappears in Super Smash Bros. Ultimate, serving as a boss in Classic Mode and Adventure Mode: World of Light. For the first time, Master Hand can face his right, while only being able to face left in previous games. In World of Light, an army of clones of the original Master Hand serve under the villain Galeem. When the player fulfills all requirements for the game's true ending, the original Master Hand and Crazy Hand open a giant rift in the sky, which the former enters. For the first time, Master Hand is playable through normal means, as he is pitted in a Mob Smash-esque match against 50 light and dark false characters. Wii Super Smash Bros. Brawl A being tied to the link between this world, where trophies fight, and the world beyond. The meaning of his existence is unknown, as are his goals, but he seems to have obtained (and kept hidden) a power that borders on absolute. He also seems to feel a certain joy in challenging chosen warriors who've claimed many victories. He waits even now in Final Destination. Wii U Super Smash Bros. for Wii U The mysterious Master Hand is the source of creation in the Smash Bros. universe. He appears in Final Destination when all other rivals are defeated. He fights with a diverse move set and only grows stronger if you make him angry. If you know when to fight and when to dodge, you'll take him down! In Kirby & The Amazing Mirror, Master Hand is a recurring mid-boss throughout the game. Once defeated, Kirby can inhale him to gain the Smash Copy Ability, allowing him to use his moves from Super Smash Bros. Melee. Master Hand also appears as a boss alongside Crazy Hand later in the game. This page was last edited on March 24, 2019, at 06:44.